We had a wonderful and very successful “Connections through Arts” event on Sunday afternoon, August 6, 2017. About 25 people attended, representing each of the Faith Trio congregations plus community members. 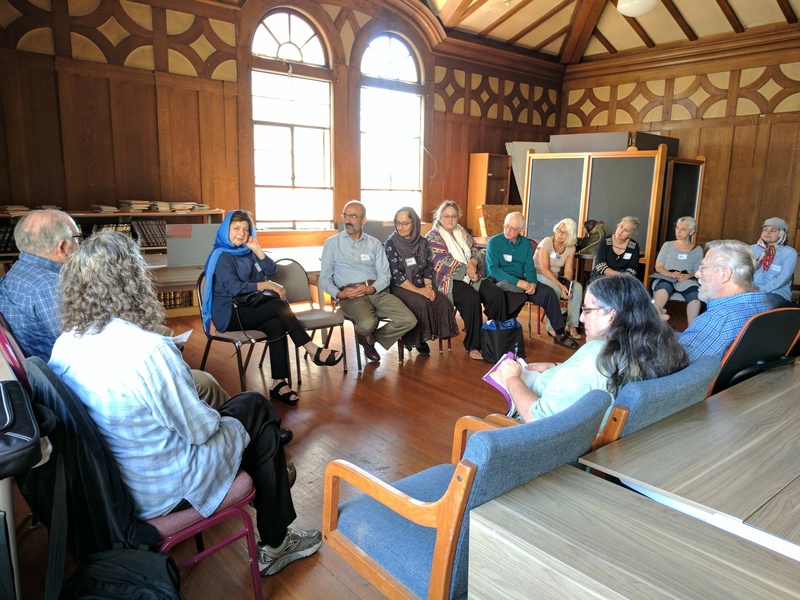 The purpose of this event was to bring together artists from the three Faith Trio congregations (Islamic Cultural Center of Northern California, Montclair Presbyterian Church, and Kehilla Community Synagogue) as well as other local artists interested in interfaith art collaborations, in order to make connections with other artists and find collaborators for the next interfaith art exhibition opening December 3, 2017. Arash Shirinbab led the program in which we learned about artistic collaborations and also experienced hands-on art collaborations. We learned about creating collaborative art from Rivka Greenberg, one of the founders of the Berkeley Jewish Women’s Quilting Group, who gave a presentation about the collaborative quilting projects this group has created. They have created 19 quilts, some taking one year to complete. There are currently seven women in this group. Rivka described their collaborative process. We also learned from Arash Shirinbab about his experiences of artistic collaborations with ceramicist Susan Felix, and with artist Forest Middleton. We discussed issues such as reaching decisions and deciding about ownership of the artwork created collaboratively. 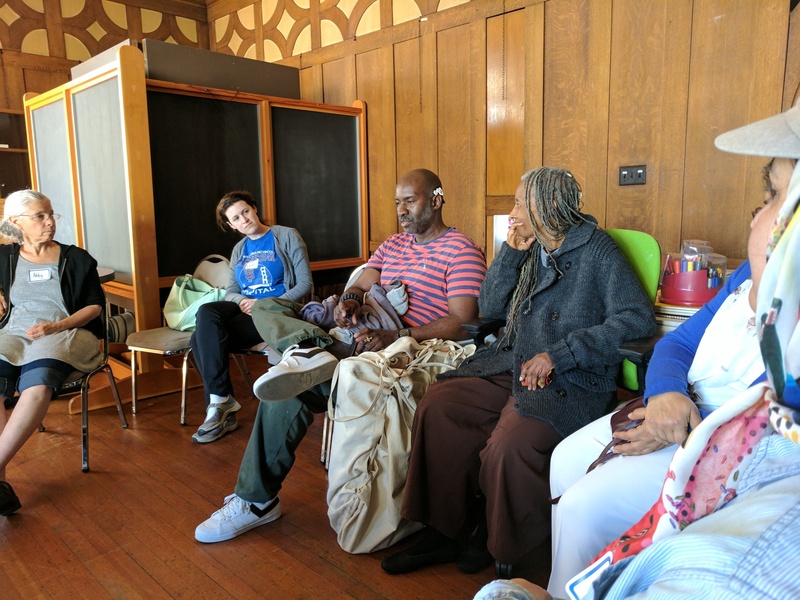 Leah Korican (Kehilla member, artist and art teacher at Bentley School in Oakland) led a collaborative art activity in which those present were randomly assigned to seven teams (most teams had three people). Each team had 45 minutes to envision and create a collaborative art piece, using art materials provided. Themes were suggested and the teams also had the option of coming up with their own themes. The art materials had been generously provided by Robin Bernstein. The artists were quite engaged with each other during this process, and animated conversations as well as interesting art pieces resulted. 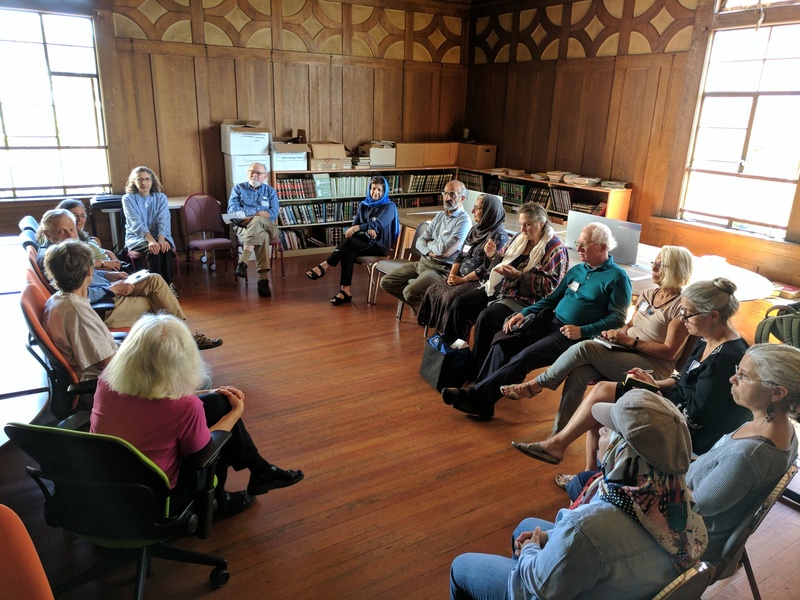 It was clear that everyone present had a very sincere desire to make positive connections with people of other faiths. After 45 minutes, each team showed their pieces and reported on their collaborative process and what challenges they experienced. Insights were shared. Some of the participants showed samples of their own artwork they had brought with them. There was also time to mingle, enjoy refreshments, and get to know other participants. All artists are encouraged to find other artists to collaborate with and create proposals for collaborative artwork, whether or not they attended this event. Proposals are due August 20, please CLICK HERE! Photos from the event can be seen HERE!